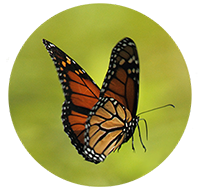 A few summers ago, the Kraus family noticed a steady increase in monarch butterflies visiting their backyard native wildflower garden. One day after an overnight rainfall, Paula Kraus was stunned to see the black walnut tree in her family’s backyard overflowing with monarch butterflies sunning their wings. “We counted 40 butterflies in that single tree,” she remembers. While that day was the crescendo to a summer full of monarch visits, their backyard garden continued to be a sanctuary for the butterflies for several more weeks. An eastern tiger swallowtail takes a sip from purple coneflower (Echinacea purpurea). “Through-out the summer, there would often be groups of ten to 20 monarchs hanging out, sipping nectar—especially on our meadow blazing star flowers. Some days we would have 50 or so monarchs visiting our garden. I had never seen anything like that before,” marvels Paula. Tom and Paula wanted to create an outdoor space that evokes images of the North Shore–one of the family’s favorite places. The garden is comprised of native grasses and forbs found in northern Dakota County, which is located in the Twin Cities metro area. 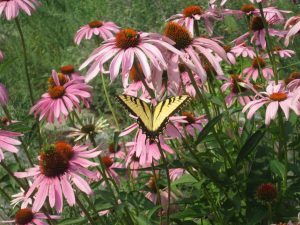 Since the Kraus family installed their native plant garden five years ago, they have welcomed all kinds of visitors to their backyard—a wide range of butterflies, birds, and bees—as well the human visitors who are interested in taking in their backyard habitat. 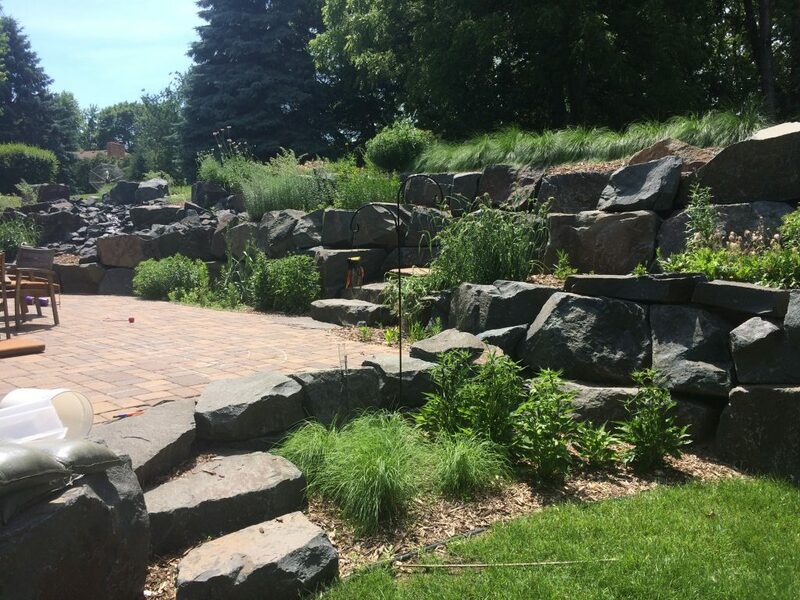 The garden, designed by Tennent Landscaping, is planted exclusively with Minnesota native flowers and grasses. Most of the plants in the garden were purchased from Outback Nursery. A wooded area beyond the garden—which had been overrun with Siberian elm and other invasive woody plants—has been replanted with native oak, maple, hackberry, and pagoda dogwood trees, to name a few. 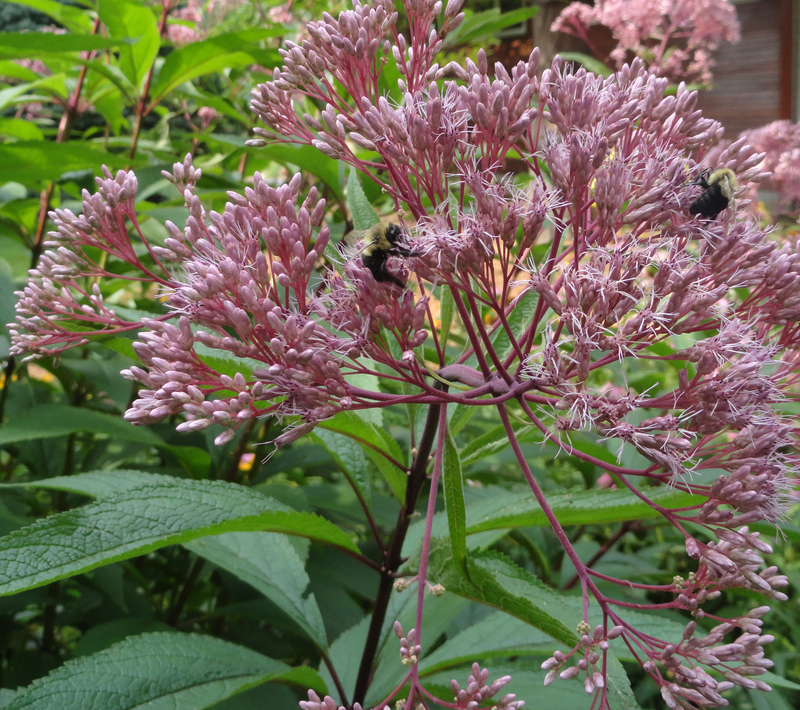 The Joe Pye weed (Eupatoriam maculatum), which attracts a wide variety of bees and other pollinators, is one of the Kraus’ favorite flowers in their garden. 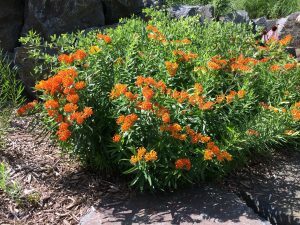 The brilliant orange of the butterfly milkweed (Asclepias tuberosa) is a native plant garden favorite. This dazzler is showcased prominently in the Kraus family garden. Paula’s husband, Tom, who grew up on his grandparent’s 110-acre dairy farm, originally pushed for the idea of creating a native plant garden. “As a kid, I had all these natural spaces and wetlands I could explore,” explains Tom, who has warm memories of catching frogs, snakes, and salamanders while exploring the property. Paula and Tom wanted their four young children to experience some of the adventure of wildlife discovery in their own yard. Tom knew that a garden planted with Minnesota natives would attract the most wildlife. And it has. “The kids love looking for bugs, caterpillars, spiders. And when a visitor asks about a flower or something in the garden, our kids love being the one to give the answer,” says Paula. The Kraus family garden, while planted only with native vegetation, follows formal garden design principles and fits well into the suburban landscape. “As with any garden, we weed on occasion, but we rarely need to water and it never needs fertilizing,” explains Paula. “When we do have to weed, we turn up the music in the backyard to lure the kids into helping,” says Paula with a smile. 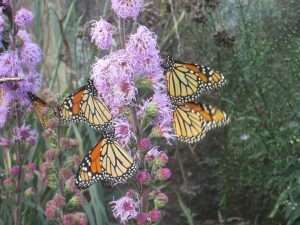 To see a short video of monarchs sipping nectar on meadow blazing star in the Kraus family backyard garden, click here.